What can I say I’m a giant kid at heart, so naturally something as awesome as this by one of my favourite food blogs; Sweetapolita would catch my eye. 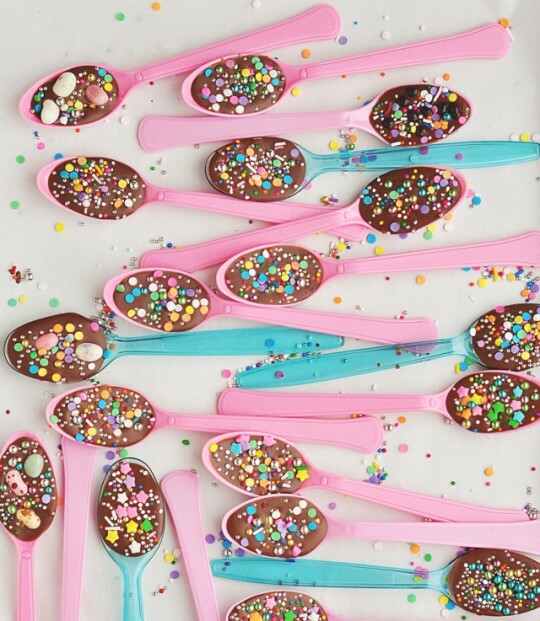 It’s way fun, colourful and if you didn’t notice it’s got chocolate too, what’s not to love! Sprinkles, jelly beans, funfetti – any brightly coloured sugared confection of your hearts desire! Arrange plastic spoons on a tray lined with baking paper and using a spatula or book (whatever you can find really) to rest the spoon handle so that the spoon is level and straight. Temper chocolate in microwave, remembering to stir every 30 seconds, and once melted and smooth spoon melted chocolate into the plastic spoons, making sure not to fill them to the top as sprinkles will fill and you may end up overflowing!